Mix all ingredients and use pipe cleaners or six pack rings to make your own wands.Bubble Solution (Large Amount):1 gal. water1 c. Dawn1 Tbsp. 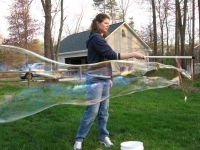 glycerine Put bubbles into a large tub and use a large ring (Hula-Hoop) to make bubble walls around the children.